New South Wales offers just one legal land-based gambling establishment – The Star. However, at the time of writing, there are plans for another hotel and casino known as Barangaroo. This is aimed at high rollers however, and isn’t set to be open until 2021 so for now the Star is our only option. This isn’t a bad thing however, as it is the second-largest casino in all of Australia, and has both the gaming and amenities to match that size. Additionally, a $350 million facelift was completed with plans of $1.1 billion revamp in the works. The Star obtained its first license, albeit temporary, in 1994 and opened in 1995. Two years later, it opened permanently and has successfully been operating ever since. 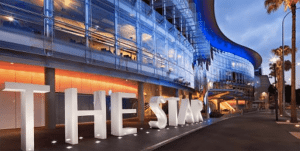 The Star operates 24 hours a day, seven days a week and is located next to the Sydney Harbour. Players can get free parking if they spend at least $15 at participating venues – mostly food outlets so grab lunch and score a park for free. The complex also offers shops, bars, clubs, hotel towers and more along side the gaming facilities. 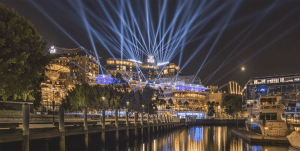 The Star Sydney Casino has a license to offer up to 1500 electronic gaming machines, with around 1499 running at any given time. The majority of these machines are pokies, but players can also try video poker and keno machines, and the always-popular Rapid Roulette terminals are also included in this number (though they are attached to roulette tables). The Star also features a wide variety of table gaming options, including blackjack, baccarat, roulette, craps, Pontoon and Caribbean Stud Poker. For many years, the casino also offered the Australian game of two-up, but it was removed in 2003 when the game no longer appeared economically viable, leaving the Crown Perth with the only casino two-up game in the country. 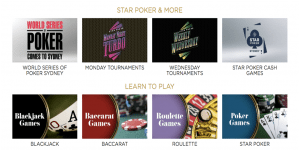 Star Sydney also operates a 24-hour poker room which offers both cash games and tournaments. The room features 30 tables and is located near the 24/7 Sports Bar on the main gaming floor. Cash games are available in both No-Limit Hold’em and Pot Limit Omaha formats, with $1/$2 blinds being the most common. For tournament play, weekly tournaments are held on Mondays and Wednesdays, while major events like the Australia-New Zealand Poker Tour also make regular stops in Sydney to host tournaments at the Star. Those looking for VIP treatment will want to obtain an invitation to the Sovereign Room on the third level of the casino, where bets may range from $25 to a maximum of $75,000. Top high rollers might even be welcomed into the Inner Sanctum, where the maximum bets rise to a massive $500,000, though only the biggest whales will find themselves in this exclusive area. 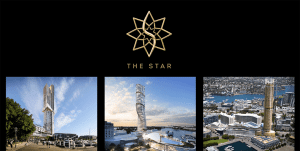 The Star features two accomodation towers including The Darling and the Astral Tower & Residences, both of which offer a luxurious hotel experience. There are 16 restaurants available at the Star, including Momofuku Seiobo – offering the best Australian ingredients in a menu that constantly changes with the seasons. There’s also faster options and casual dining at the sports bars and cafes around the casino. The Star’s Event Centre also hosts a variety of different entertainers, from musicians and comedians to awards shows and more. Various areas in the centre can also be used for conferences and meetings, special sporting events, exhibitions and trade shows. The casino also contains a number of different nightclubs and bars that are designed with a variety of different purposes in mind. For instance, you can catch live music at Rock Lily, or enjoy a cocktail at Cherry. Meanwhile, the Marquee nightclub offers DJs from around the world. Finally, those looking for a more relaxing time during their stay will want to visit The Star’s 16-room day spa. The Spa, located inside The Darling Hotel, features a couples suite, a Turkish steam room, and much more. While it appears to be only a matter of time before a second major casino is opened in Sydney, the Star are doing everything they can to keep players at their venue. Australian billionaire James Packer, who owns and operates the Crown Casino venues in Melbourne and Perth, is planning a gaming resort designed specifically for high-rollers. To combat this, Echo Entertainment, which operates The Star, have proposed their own $1.1 billion redevelopment project. It is too early to say which of these proposals will ultimately draw the most players, especially with the impact of Crown Staff being detained in China. However the Star is an incredible casino for Sydney, and New South Wales players, plus there are some fantastic pokies venues in Newcastle and spread around New South Wales for those heading outside of the city. If you can’t make it to the Star play at Raging Bull Casino, our top-rated casino site for players from United States, and choose from hundreds of casino games from the comfort of your own home.